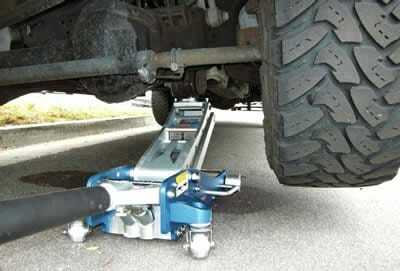 When you have a truck, 4×4 or SUV, you will require more than a standard floor jack to lift your vehicle. There’s a lot of choice available so below we tell you what to look for and what we think are the best options. It can be challenging to lift a big vehicle like a pickup truck or SUV unless you have a car lift. Obviously, a big vehicle is going to be much heavier than a normal car, because of this, you will need to look for a jack that can handle a heavy weight safely. It would be a disaster if the jack failed and damaged your car, or even worse, damaged you. To handle an average truck or SUV safely you need a floor jack with a maximum lifting capacity of 3 tons. Another aspect to think about when it comes to lifting these types of vehicles, is the height of the vehicle from the ground. Clearly, this type of automobile is going to be taller than an average car. If a jack can’t completely lift your vehicle off the ground, it’s useless! Usually a maximum lift height of around 16 inches is enough to handle most cars but double check the height is right for your particular truck or SUV. All the floor jacks listed below fit these two criteria. They have a high weight capacity and good maximum lifting height so they are all safe models, but again, double check your vehicle details. Click the buttons above for more information about each model, or read on for our review of each of the top 3 floor jacks. What Is a Floor Jack? Pump To Travel Ratio – The what?! The floor jack we would recommend as our first choice is the Powerzone 38004 . It easily fits the basic criteria of lifting 3 tons over 16 inches. Users have reported raising vehicles weighing 6,000 tons easily, even camper vans and tractors. To keep you safe, the Powerzone has a useful safety valve to prevent overloading the floor jack beyond its rated capacity. Not only does this floor jack go high, it also goes low. It can lift to 18 ¼ inches but it also goes as low as 4 inches, meaning it can fit under Mini Coopers and Chevrolet Corvettes. For the maths fans, that means it has a lifting range of 14 1/4 inches! The Powerzone weighs about 60 pounds, although it can seem lighter. It achieves this low weight by using steel where it’s needed, for instance in the lifting arm, but aluminium for lightness where possible. To make it easier to move around it has two solid metal wheels fitted to the front and at the rear two more metal wheels that can pivot through the full 360 degrees. You get a dual piston, quick-lifting hydraulic system to help you get on with your work faster. With no weight on the jack, five pumps of the handle will take it to full height. It’s designed to take it slow and steady when it does reach the weight of the car but it is still quick to raise up, usually twelve pumps will do it. More DetailsOf course, what goes up must come down and you don’t want to rush that part of the job! 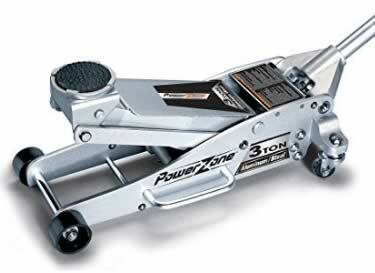 The Powerzone floor jack is designed to lower your car in a slow controlled way. The handle twists right to close the valve when you have the jack at the height you desire. To lower it slowly, twist to the left a little to open the valve and lower gently. To protect your bodywork, the saddle has a round rubber insert in the center. The handle is also padded on the lower half to make sure it doesn’t scratch your paint. To make it easier to store the handle is detachable. The handle is 45 inches long and comes in two parts that are connected with a lock screw. To finish it off, all the metal is coated in grey paint so you don’t have to worry about rust. The final deciding factor in favour of the Powerzone is the incredibly reasonable price. Capable of handling tasks of jacks costing several times more it is great value for money while not compromising on performance. Second place in our opinion goes to the Pittsburgh Automotive Floor Jack. As you might expect, it’s similar in a lot of ways to the Powerzone with a few key differences. Obviously it passes our basic requirement of lifting 3 tons and going to at least 16 inches. But if you were impressed with the Powerzone’s range be prepared to be wowed by the Pittsburgh’s range. Starting as low as 2 7/8 inches it goes all the way up to 19 ¾ inches giving it a lifting range of 16 7/8 inches. The Pittsburgh has a rapid pump feature featuring a dual-parrallel pump system. In practical terms this means it should only take three and a half pumps of the handle to achieve full height. Turn the handle counter clockwise and it gently lowers back down to the ground. The handle on this floor jack also comes in two parts with foam rubber round the lower half to protect your car. This handle is 45 ¼ inches long and is made from knurled steel. The Pittsburgh has a grey industrial-grade finish and boasts precision-welded construction. More DetailsSo why is this floor jack in second place? The main reason is the weight. Being solidly made from steel means that it weighs in at 71.7 pounds. It has metal castor wheels at the front but the rear wheels are not quite as maneuverable as the Powerzone. Both have a similar size lifting saddle but if you want rubber padding you need to buy it separately as an extra with the Pittsburgh. The Pittsburgh floor jack is popular with users. Reviews say things like ‘This is a VERY nice, sturdy and trustworthy piece of equipment,’ and ‘Such an irreplaceable tool! I wish that I had bought one a long time ago.’ There’s over 165 reviews on Amazon giving the Pittsburgh four and five star reviews. The final clincher is the price. For such a solid, well-made piece of equipment the price is amazingly low! Our final recommendation is the Torin Big Red Hydrrauliv Trolley Floor Jack. It’s a bit smaller and a bit lighter than our previous two recommendations but most importantly – it’s a lot cheaper. Unfortunately this means the quality isn’t quite as high but it’s still a good jack. The Torin has a lifting range from 5-7/8 inches to 17-1/4 inches, with an extension to the handle that lifts it up to 21 inches, usually enough to handle a SUV. The Torin has a lifting capacity of 3 tons, enough to raise a SUV. Despite it being cheaper, it’s still a solid machine. You have an extra heavy-gauge steel chassis frame and added side to make it stronger. You also get precision hydraulics and a dual-arm levelling mechanism designed to give a steady lift. To keep you safe, there is a built-in safety overloads system. There’s some nice extra features. The Torin comes with an extra long neck, aimed at making it easier and quicker to lift SUVs. The saddle rotates to make it easier to get into position. The rear two wheels swivel through the full 360 degrees to make it easier to move the jack around. Also, as the name suggests, this jack is an attractive bright red! More DetailsUnderstandably, the price makes the Torin a popular choice for buyers but many are pleasantly surprised by how well it performs. Reviewers say things like ‘Surprisingly a good little jack’ and ‘inexpensive, high range, reliable’. All in all, this a cheap and cheerful jack that is still capable of safely lifting a SUV. If you just want a jack for occasional jobs than the low price has to make this your first choice. It can be called a trolley jack, a service jack, a garage jack or a car jack but whatever you choose to call your floor jack they are great tools. They are mainly used for lifting cars to make it easier to carry out tasks like changing tires and basic maintenance. They are designed to be kept in your garage and not carried around in your car. Floor jacks are not small and are usually solidly built from metal so they tend to have wheels on them to make them easier to move around. You need to have a flat, hard surface to use them, so they are ideal for garages and workshops. You can use a floor jack to lift anything you desire but it’s most common use is to lift vehicles. Most cars will have a groove especially designed for the jack to fit into. 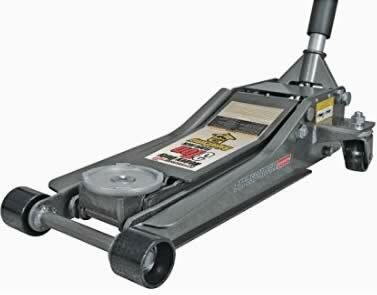 When used in the right way, a floor jack makes it safe to work under your car. A floor jack is definitely the safest and most reliable way to lift a vehicle. Floor jacks come in different sizes and can vary greatly in quality. A SUV is a big vehicle so you need to be sure that the jack you buy can handle its size. Typically you need a lifting capacity of up to 3 tons and it needs to be capable of lifting at least 16 inches. Most floor jacks use hydraulics to provide their lift. Before using a jack, first check that it has enough oil in it. Another sensible precaution is to put your SUV in park and make sure the emergency brake is firmly on. Check the floor where you are going to place the jack is clean, dry and smooth. Wheel the jack into position under your SUV. There should be a groove underneath that the jack will fit into. Then it is a simple matter of pumping the handle until you reach the height you want. You must then place a jack stand under your SUV. Although floor jacks are safe and reliable, even the best models may lower suddenly. It’s not worth risking life and limb to the strength of your floor jack when it only takes a couple of seconds to slide a jack stand into place. Depending on the job you are doing, you may need to reposition the floor jack and raise another part of the SUV. The better floor jacks have a quick release mechanism to drop the floor jack down to its starting height. A high quality floor jack should last you for years. Make sure when you have finished using it you completely release the pressure so the jack is as low as it can go. A little bit of regular maintenance can prolong the life of your floor jack. Keep it clean and dry, lubricate moving parts and if possible change the oil regualarly. You have two popular materials that I’d say 95% of all jacks are made from, steel and aluminum. Most cheaper jacks are made from steel because it’s a cheaper metal to get than aluminum. The downside to steel is that it’s a lot heavier and there for a smaller steel jack will weigh more than a much larger aluminum version. The downside to aluminum however is that because the metal costs more, aluminum floor jacks cost more. In my opinion they are worth the extra cost however. 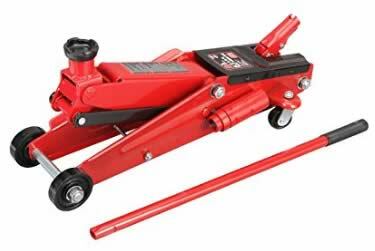 All automotive floor jacks aren’t created equal when it comes to how much the jack will rise based on one full pump. The more expensive the floor jack is, the more the arm will raise up with a single pump. This comes in handy more than you could possibly imagine. Instead of having to pump, pump, pump over and over just to get the jack to the bottom of the car you can pump once and it’s to the bottom of the car, another two or three pumps and a good automotive floor jack will already have a car or truck tire off the ground. This isn’t an advertised number however so it’s something you’ll have to test on each of the floor jacks you look at. This is a tough one for me because I own both a no name and a popular brand name of automotive floor jacks and mine both work great. I have quite a few friends that that while working in their garage with a cheaper jack have found them to leak over time and eventually fail much sooner than the name brand counterpart. The only other big thing I’d look at is to make sure any of the automotive floor jacks you are looking at can actually jack up your car. The jacks are rated in tons of weight they can hold, most are between two and three tons which should be plenty for any standard car. Guys with a truck or larger vehicle though so check to see if their automotive floor jack is strong enough to raise and hold their vehicle. Whether you’ve already bought your automotive floor jack or you’re still searching through all the automotive floor jacks available on the market it’s important to look at some of the safety tips you should be aware of before using your new automotive jack. If you only read or remember one tip this is the tip to remember. Never trust a jack no matter how new it is. I don’t care if it’s the first time you’ve used it or the one hundredth and you trust it completely, don’t. Automotive jacks can fail at any time and this includes when you’re under the car. That’s why it’s so important to have at least one set of jack stands around at all times to stick under the car after you’ve jacked it up. That way if the back does fail you won’t be crushed by the car. The second tip isn’t quite as important, but still is worth mentioning and that’s to always have another person around when using an automotive jack. I know it sounds like when you’re a kid and your parents tell you that you need to be supervised, but it really could be a matter of life or death. Doom and gloom aside, a nice set of jack stands is really important when working on your car. There will be times when you need to leave you car up over night, whether you’re having some parts refinished or are waiting for a part to be delivered. It’s important not to leave the car held up with the floor jack over night. This is when having the jack stands is great, you can put them under the car to support it and then relieve the pressure on the automotive floor jack. Having that weight on the jack for extended amounts of time, as in over 24 hours is bad for the jack and greatly reduces the lifespan. Even if you remain safe, which we hope that you do, you can still damage your SUV with a floor jack as you can see in this epic fail. Hopefully I haven’t sounded to much like a parent telling their kids what to do. This post comes from me seeing automotive floor jacks fail many times, luckily nobody has been under the car when it happens in my case. Companies like Craftsman have seen how safety is important and they actually make a great package that you can purchase that comes with an automotive floor jack, set of jack stands, and a creeper for just over $100 dollars. If you take nothing else away from this do your family a huge favor and use jack stands when you’re under the car.